Dr. Jared Barnes, assistant professor of horticulture for Stephen F. Austin State University's Arthur Temple College of Forestry and Agriculture, is the recipient of the 2017 Keep Nacogdoches Beautiful Sustainability Award. The award recognizes community members who make a concerted effort to promote the role of sustainability throughout the Nacogdoches community. Pictured from left, horticulture students Chisolm Tessem, John Dilday and Colin Burke; Karen Barnes; Dr. Jared Barnes; and Jamie Bouldin, Keep Nacogdoches Beautiful board of directors' member. 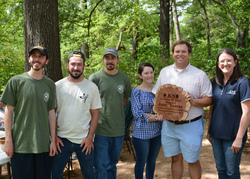 NACOGDOCHES, Texas - Dr. Jared Barnes, assistant professor of horticulture for Stephen F. Austin State University's Arthur Temple College of Forestry and Agriculture, received the 2017 Sustainability Award from Keep Nacogdoches Beautiful during the SFA Earth Day Celebration, April 1. The award recognizes community members who make a concerted effort to promote the role of sustainability throughout the Nacogdoches community. Since joining SFA in 2014, Barnes has made great strides in reaching his goal of doubling the enrollment of SFA's horticulture program. Two years into his five-year time frame, the program lacks only two students to achieve this goal. "I focused on developing programs with edibles and reinvigorating the gardens around the Agriculture Building that would make the horticulture program more attractive and relevant to potential students," Barnes said. The expanded-and-redesigned garden, dubbed Sprout at SFA, provides student-grown produce for a weekly market located behind the Agriculture Building. Through this endeavor, Barnes also has increased the visibility of SFA's horticulture students. These students have been featured on the covers of Sawdust, SFA's alumni magazine, and Nursery Management, a national trade publication. In addition to having taught more than 400 students in nine separate courses, Barnes currently serves as a major professor for two graduate students, as the faculty advisor for SFA's Horticulture Club, and he conducts his own academic research. "I have always been a very curious person and strive to answer questions about the natural world," Barnes said. "I bring that curiosity into my research program at SFA." In 2016, the Perennial Plant Association named Barnes the 2016 Young Professional of the Year, and Greenhouse Product News recognized him as one of the top 40 horticulture professionals under 40 years old.